Discontinuing Lake County Board members’ use of Purchasing Cards (P-Cards) is one of many recommendations made by the Lake County Board’s Rules Committee and approved by the full Board. The Rules Committee recently met to review its Rules of Order and Operational Procedures, as is traditionally done following an election and the Board’s reorganization. The Committee approved several measures related to Board spending, including travel, technology, and mailings. The Board also has created a new Energy and Environment Committee to focus on sustainability and the impact of climate change, the County’s carbon footprint, as well as energy and environmental policy and energy and environment legislation. Watch this video as Rules Committee Chairman Paul Frank explains more. 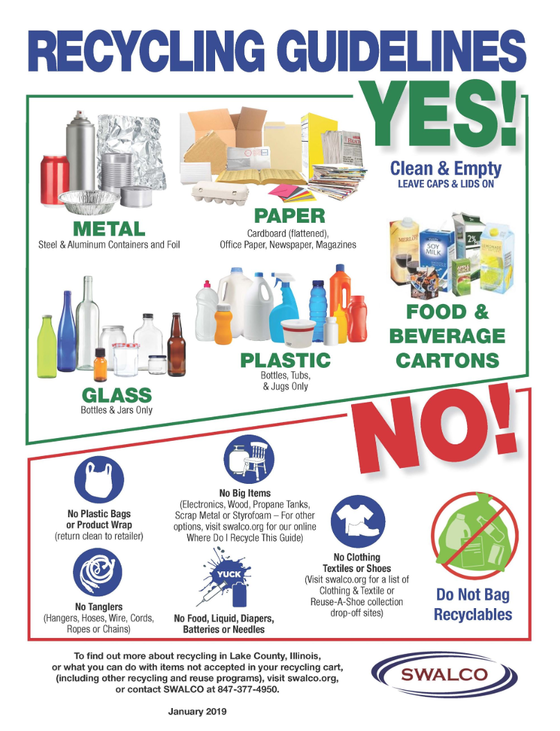 On America Recycles Day, SWALCO and other agencies and communities around the State released a new set of guidelines for recycling. Since then, discussions with local recycling facilities have led to a few new updates. Please find our “recycling reboot,” the latest Lake County, IL Recycling Guidelines. Take a special look at the NO list as these items can negatively impact recycling efforts in many ways. It’s estimated that as many as one in four items placed in a recycling cart is not accepted for recycling. A New Year is upon us, and it’s a great time to review and make sure you are getting all the right things in and keeping all the wrong things out. You can find alternative recycling and reuse opportunities available in your community at swalco.org, along with more detailed information and frequently asked questions about recycling. Look for our Guidelines to be available in Spanish sometime in the near future, along with other new information. It’s as important as ever before to continue to recycle. Through recycling, we have an abundant supply of resources at hand. Recycling preserves landfill space and reduces the need for landfills. By recycling, we save energy, prevent water, land and air pollution, reduce carbon missions, protect wildlife and wildlife habitat, create jobs and help the economy. Please visit swalco.org to learn more. Kudos to Lake County Sheriff's Deputy John Forlenza and K-9 Dax. The two were called upon by the Zion Police Department to help locate two offenders that fled from a stolen vehicle originally pulled over at a traffic stop. Dax alerted on a vehicle in the backyard and located a juvenile hiding under a blanket in the backseat. The juvenile was the driver of the stolen vehicle. This holiday season, remember what you should do on the road so you and those around you arrive safely to your holiday destination. The Lake County Sheriff’s Office is conducting a safety campaign now through Jan. 3 to make drivers aware about the dangers of impaired driving as well as enforce live-saving seat belt, speeding and distracted driving laws. Follow these life-saving tips! State, regional and local officials recently gathered to discuss Lake County transportation needs at the Lake County Transportation Alliance (LCTA) annual meeting. A major focus of discussion was improving the quality of life in Lake County through a multi-modal transportation network that provides mobility and economic opportunity for all. Watch this video to learn more. As family and friends gather for the holidays, flu activity is increasing. It’s not too late to get a flu vaccine. There are many myths about the flu vaccine. Watch this video as Jennifer Gassman, a nurse practitioner at the Lake County Health Department tackles some common myths. The Lake County Health Department offers the flu vaccine by appointment at its immunization clinics and community health centers across the county. Many doctor’s offices, retail locations and pharmacies also offer the vaccine. To find a location near you, use the vaccine finder. Community members as well as business and government leaders recently visited the College of Lake County’s new $28.3 million Science & Engineering Building, which supports the latest in science and technology education while having several environmentally friendly features. The state-of-the-art building features labs for chemistry, mechatronics and photonics, and includes rooftop solar panels, geothermal heat pumps, LED lighting, and a green roof. Find out more. I consider it an honor to be able to serve the Waukegan, Gurnee, Beach Park and Zion communities as your District 2 Board Member. I hope this newsletter provides you with an insight to Lake County news, local topics and a way for you to connect with neighbors and fellow residents. Remember, you can get relevant and up-to-date information important to District 2 on my Facebook page! Like my page today!